Anyone looking to achieve optimal health has to consider nutrition as the single most important ingredient for success. In a perfect world, all of our nutrition should come from the food we eat. Supplementation should not even be an issue. In the real world, however, most of the foods we eat are riddled with fertilizers, herbicides, pesticides, and hormones – not to mention that they are often hydrated with polluted water. In addition, an ever-growing percentage of our food comes from other countries, which don’t always have the best inspection track record. And if all that weren’t bad enough, the natural nutrient value of the soil that produces these foods has also been diminishing over the years, a trend that will only continue. This is why it’s necessary for us to take a hard look at our diets and make a decision about whether we may need supplements. As you can see, proper nutrition nowadays is not that easy; it does take some time to educate yourself. By proper nutrition, I mean eating clean and safe foods that have the nutrients your body requires to get and stay healthy. Your two main purposes for eating a healthy diet and taking supplements are to give your body what it needs to heal itself and to minimize the level of inflammation that is in your body. The inflammation is what is causing your pain. Drugs that fight pain do little, if anything, to help the body heal itself. In fact, some of these drugs can have severe negative side effects, so please consider eating right as an alternative. If you are suffering from any form of back pain or sciatica, I have a recipe for relief. This is a vary basic look at how foods and supplements can help heal the body. Water: Some people believe that we get enough water from our foods and don’t need to drink much of it. Others believe that we need to drink 50 to 100 ounces per day – every day. Truth is, your body will tell you what it needs; you just need to know how to listen. Here are some signs that you may need to be drinking more water: constipation, muscle spasm or cramping, and darker urine. If you’re taking any medication, or if your blood pressure is not stable – certainly if it’s too high – you may not want to drink lots of water. Protein: Proteins are the building blocks of our bodies. Without an adequate supply of quality protein, your body will actually steal protein from itself to meet its basic needs. This is a sure way to slow down the healing process. There are probably 10,000 theories on which are the best proteins and how much a person should get each day. In my opinion, a safe and healthy amount to shoot for is 3 to 7 grams per pound of body weight. For example, a 100-pound person should get 30 to 70 grams of protein per day. A personal note: I do not eat soy anymore because it has phytoestrogens, which are very bad for the man tool. Phytoestrogens can also cause hormonal imbalances, among a number of other bad things, in some women. Instead, I eat proteins that come from the top of the food chain. Most chickens peck the ground and eat grains, dirt, and their own excrement. I only eat free-range beef, lamb, and wild salmon. My favorite protein source is fish – but never farm-raised. Farm-raised fish swim around in their own excrement and are fed man-made pellets fashioned out of who knows what. In fact, farm-raised fish have a higher Inflammation Factor (IF) than chocolate ice cream. Fat: Fat is a critical component to a healthy diet. The question, of course, is: Which fats should you be eating? As a rule, anything that is hydrogenated or made from corn, cottonseed, or soy is not going to help you at all. This is also true of fats cooked at high temperatures. I eat fats from fish, beef or lamb. I cook with butter and coconut fat, which I highly recommend. It adds a distinctive sweet flavor and tolerates higher temperatures much better than most oils. Carbohydrates: Yes, carbs are important. And, no, they don’t have to make you fat. You just need to know the difference between simple and complex carbohydrates. Simple carbs break down very quickly and are found in soda, juice, and candy. They are usually go under the names “high fructose corn syrup” or “dextrose.” Simple carbs can cause an increase in inflammation. Complex carbs break down much slower and are mainly found in whole grains, legumes, and vegetables. Simple rule of thumb: Anything white – rice, bread, etc. – is not likely to do anything but fill your belly. Fiber: If you are not getting at least 35 grams of fiber a day, which very few people can do on a regular basis, you will need to supplement. If you don’t eat it, supplement it! That’s my rule, and that’s why I take all kinds of supplements. If you don’t get enough of the nutrients I listed above from the foods you eat, then your only choice is to use supplements to make up the difference. Otherwise, your internal systems will try to steal these nutrients from another part of your body – much the way it does with protein, water, or calcium. Mutli-Vitamin/Mineral: I recommend that you take a complete multi-vitamin. Because vitamins and minerals work together, there needs to be synergy between them. For example, calcium needs magnesium, vitamin A needs vitamin B, vitamin B needs C, and so on. They all work together, each doing the job the other cannot; and each supplying the body what the other does not. Having said that, I believe it is best to take a multi in liquid form because of something called “bioavailability”. This simply means that the amount of a substance the body can utilize is higher via a liquid than it is by way of a capsule or tablet. Colon Cleanser: Since it’s so hard to get 35 grams of fiber a day from food, one tablespoon of supplemental fiber daily in juice is the answer. It has been said that if you only poop one time a day, you have up to eight meals left over in your colon. This is not healthy for a number of reasons, not the least of which is the pressure on your spine. Digestive Enzymes: Do you ever feel as if you’re in a coma after lunch – like your body is working overtime on your meal? A full-spectrum digestive enzyme will help break down your lunch and improve your digestion, making the nutrients in your meal more readily available to your body. Systemic Enzymes: Systemic enzymes are different than digestive enzymes. Systemic enzymes work outside the gut and are proteolytic, meaning they break down proteins. They also work on excess fibrin and scar tissue throughout the body, improving blood flow and removing any metabolic wastes, which will minimize inflammation and pain. Glucosamine and Chondroitin: These two sulfates are found naturally in the body. Glucosamine comes from amino sugar, and it helps in the formation of cartilage at the joint. Chondroitin is what gives cartilage its elasticity. Both of these have been studied extensively, and they show a great deal of promise. What is important is the dosage, which should be based on your body weight. I have only scratched the surface of how nutrition and supplements can help you. It’s now up to you to educate yourself further on this topic. I’ve given you some basic information, so you will at least have a good idea of what to look for. Remember that in order to perform at its peak or to overcome an injury, your body has to work much harder. It will also have higher nutritional requirements as it tries to heal itself and overcome the symptoms of chronic inflammation. Those requirements will depend on your specific condition. 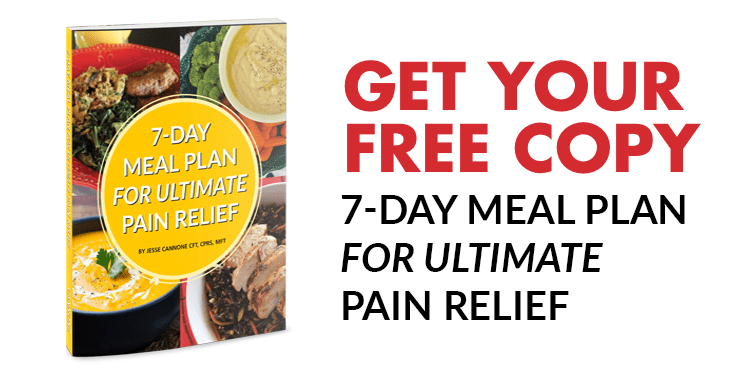 To learn more about how you can get lasting relief from your Back Pain, we suggest you read the latest copy of our Back Pain Relief Guide. Fill out the form below now and you’ll receive free instant access.